My Home and Garden: The story of my Christmas Tree and how I make it happen!! The story of my Christmas Tree and how I make it happen!! I have been collecting Christmas ornaments for 42 years. 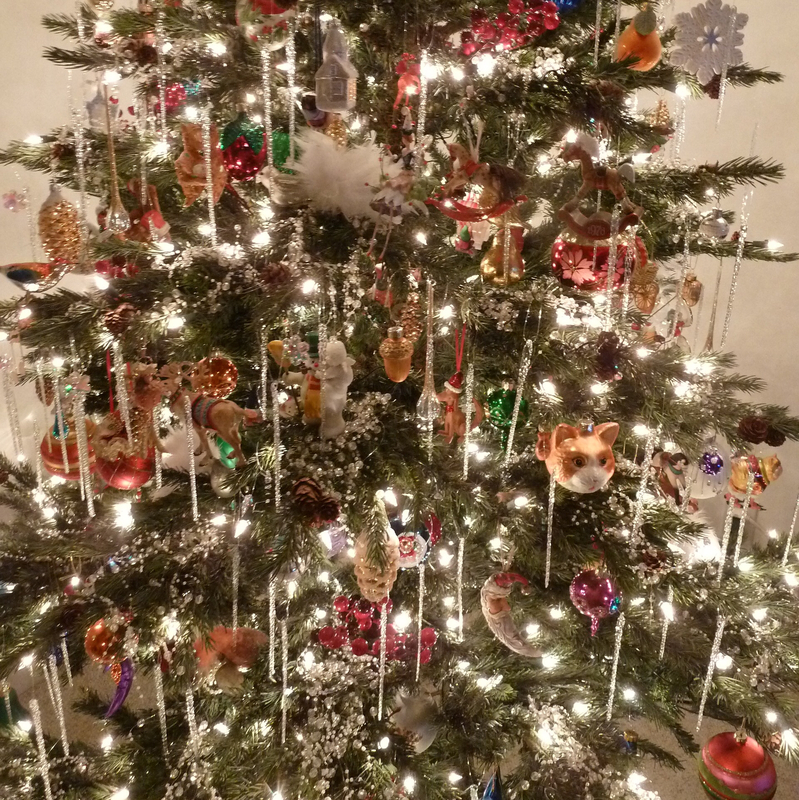 I was inspired by a tree I saw with all different types of ornaments and finished with plastic icicles. I loved it. This was in a time when everyone's trees were decorated by colour. For example, you would have blue lights, with blue and silver shiny balls and finally some tinsel. So this unique tree fascinated me. I immediately started looking for different ornaments. I was about 18. There weren't any Christmas stores near me, so I found some wonderful Hallmark ornaments. We have the first rocking horse in their long running series. Once there were Christmas stores, it all became much easier. I began collecting in earnest, and then discovered Glass Icicles. I think I have about 300 of them. I buy at least one ornament per year. I have gotten choosier as the years passed and the tree became fuller. All the ornaments are wrapped in tissue and stored in Rubbermaids, so it takes me two days to decorate the tree. 1. Start by putting on all of the hanging ornaments. I begin with the German Glass, new and Antique. They are exquisite and I place them in special places. In the first phase I place the really special decorations as well. Like the little pecan mouse sleeping in a walnut that my son Noel made in Grade 2. I love it with all my heart and place it front and centre every year. 2. I then place the old hallmark ornaments. 3. Next, the Snowbaby, Wedgwood, and other quality heavy ornaments. 5. Then I put on the filler ornaments. They are the small ornaments that can fill those tiny spaces where nothing else will fit. 6. Next is the little ice ball garland. I had several and cut them into two foot lengths and place them on the branches. They look like ice on the branches. 7. I have some branches of red berrys that I cut into smaller pieces as well. They were large and many branches per stem and I cut them into three branch pieces. They get placed here and there in the tree. 8. The last step is the most satisfying. Glass icicles. The more you have, the better. This is the part that makes the tree come alive. My tree has 800 lights on it, so this makes the tree sparkle. Literally. I would buy new icicles every year on sale after Christmas. I have about 300. Many have broken over the years, as kids and cats knocked them off, so maybe it is about time I grabbed another 20 or so to make up the missing. I hope this helps you start your own traditional family tree. It will be wonderful for your own family to stand around the tree and reminisce over the stories that surround the ornaments. That, my friends, is the absolute best part. Merry Christmas.